Latex vs alkyd: There are two basic types of exterior paint: water-based latex and oil-based alkyd. Latex has many good qualities. It cleans up with soap and water, dries quickly, doesn’t have a strong odor and is flexible. Alkyd paint also has pros and cons. Aklyd paints require mineral spirits or paint thinner for cleanup; soap and water won’t do the job. This type of paint is durable, stain-resistant, flows smoothly and dries with fewer brush marks, Popular Mechanics says. But be aware that alkyds have a strong smell and dry very slowly. 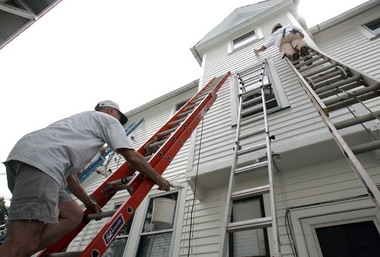 Have you ever painted your home’s exterior? Share your best tips in the comments. Paintbrush or roller: Use both for best results. Use a brush to paint onto narrow surfaces, edges, and smaller areas. Grab a short roller on large and long surfaces such as siding and trim.